There’s a key point in Bentley’s timeline that we can call BC: Before Continental. 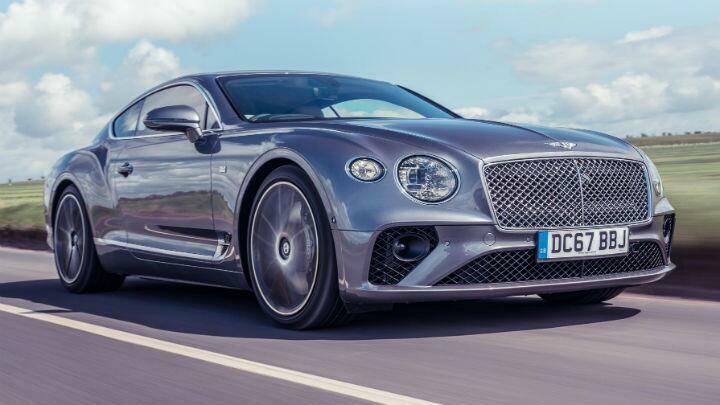 So vital was the first Conti GT – not only for sales, but setting a template and tone for the whole brand – that you could easily argue that were it not for the two-door coupe Bentley might very well not be with us today. 66,000 have been sold in the last 13 years. That’s a huge number. The most successful luxury car of modern times? Probably. And now there’s a new one. It must sell well, and it must still be the focal point for the whole brand, to embody what a Bentley is so we don’t assume it’s an SUV with a body image problem. It’s a handsome thing, the new Conti GT, at least in profile, where the front wheels have been shifted forward 135mm to improve the weight distribution and drop the engine lower and further back in the chassis. 55 per cent of the weight still sits on those front wheels, but there’s less of it than before – the body alone is 80kg lighter, helping the new Conti GT weigh ‘only’ 2,244kg. But Bentley has made no secret of the fact that a heavy kerbweight actually helps deliver the road-crushing stability and momentum that characterises the way its cars drive. Powerful 48v electrics from the Bentayga are used – among other things – to manage the suspension, actuators on front and rear anti-roll bars combating body roll. The set 40:60 power split is now fully variable, actually sending 100 per cent of torque to the rear wheels as often as possible to the benefit of fuel efficiency and emissions. The W12 engine (basically two V6s on a common crank) is carried over, albeit modified enough for Bentley to declare it the ‘most advanced 12 cylinder engine in the world’. It features cylinder shut off under light loads, while also producing 626bhp and a thumping 903Nm of torque from a mere 1,350rpm, maintaining that through to 4,500rpm. Powering all four wheels through an eight-speed gearbox and featuring a launch control system, 0-100kph takes 3.7secs and top speed (largely thank to a slippery 0.29Cd drag factor) is 331ph. Standard specification includes full Matrix LED lights, a 12.3in central touchscreen, wifi, head-up display, night vision, a 650w stereo and 21-inch wheels. Pricing starts at £159,100, putting this in direct competition with the likes of the Aston Martin DB11, Mercedes S63 Coupe and Ferrari Portofino. In time other versions will doubtless become available – a twin turbo V8 and almost certainly a hybrid, a convertible and so on. But this first version is the one that counts. 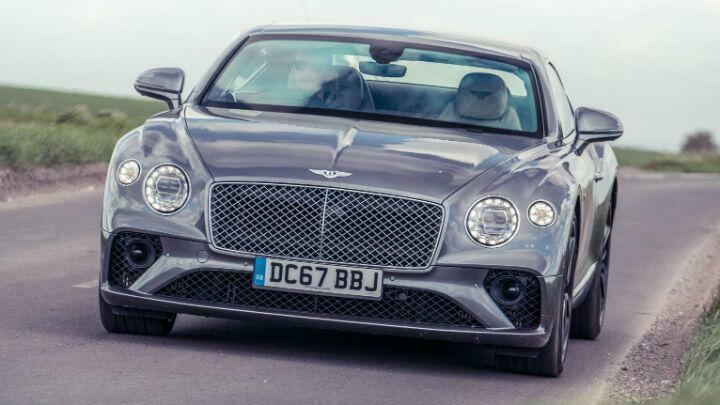 The car that carries the weight of Bentley’s expectations on its broad shoulders. In an example of function following form, the more athletic-looking new Conti GT is also more athletic-driving. The 48v electrics have been the making of this car. The system is impressive enough at keeping the Bentayga behemoth under control, but using them to underpin the Conti gives it a dynamism it hasn’t had before. The old Continental used to heave and struggle to keep its mass in order. Now it doesn’t. In fact the way it goes round corners is uncanny. Open the bonnet and you’ll see the engine is still a long way forward, still mostly ahead of the front axle, but the front end grip, the lack of roll, the fact it actually changes direction astutely, well, that’s all new. It’s noticeably less nose-heavy, aided no doubt by the front axle positioning as well as the electrics. It really will carry and maintain speed across country and this is very welcome. Also welcome is the body control. Keeping two-and-a-quarter tonnes of the coupe in check is no easy task, and yet the new GT retains its composure way beyond the point where high expectations collide with physics-defying mysticism. Don’t get me wrong, it’s still a heavyweight, but the tendons and ligaments of the double wishbone front and multi-link rear suspension with their three-chamber air suspension spring/damper units are better able to keep control of the masses involved. You can affect things too – a rotary controller on the console switches between Comfort, Bentley, Sport and Custom modes. In the first two up to 38 per cent of power can be directed to the front wheels, in Sport that drops to 17 per cent. The ride firms up and the engine and transmission sharpen their wits. 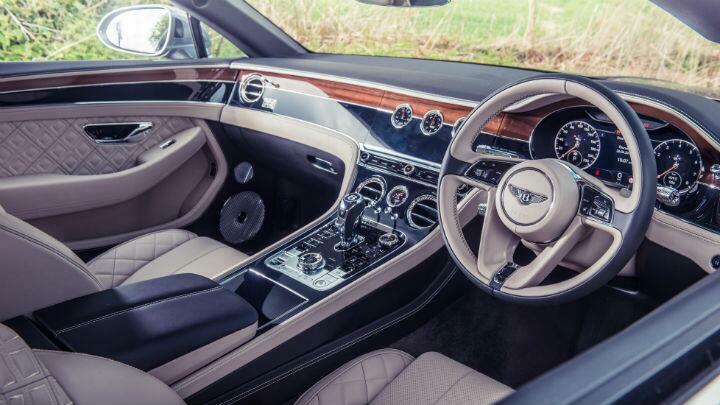 Bentley mode covers most requirements ably. It is monstrously fast. Monstrously. All that torque arrives at the road with a new found suddenness and aggression. This was intentional. Customers wanted their cars to pack a bigger punch, so gone is the huge surge, replaced by an immediacy that takes some getting used to. And there are other changes that jar. Besides engine calibration, there’s a bit of wind noise, the 22-inch wheels (equipped with 275/35 front and 315/30 rear tyres) fitted to this car kicked back and were noticeably noisy on some surfaces, the steering didn’t glide through my hands as effortlessly as it used to. 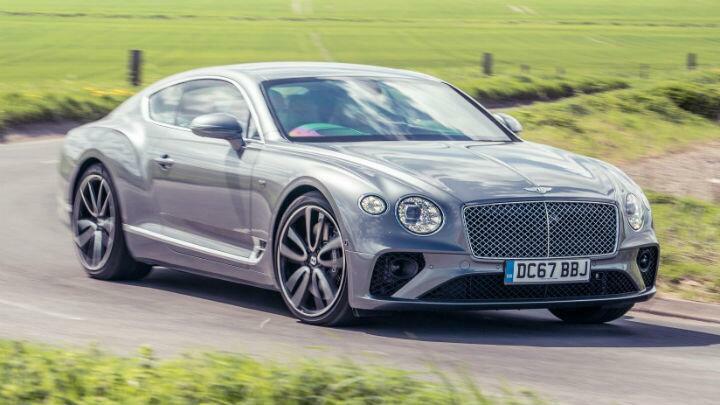 In short the Conti GT has become more sporty, and in doing so has lost some of the steamroller ability to crush distance that it used to have. Don’t get me wrong, it’ll still destroy miles more ably than almost any rival, certainly better than an Aston DB11, but it no longer has the same portly waft. You’re more aware of what it’s up to. Perhaps this is a good thing – it’s clearly what buyers wanted, and I’m certainly not going to decry the brakes, which finally, finally deliver the stopping power commensurate with their enormous 420/380mm f/r disc size. Enough to keep a rein on 626bhp of hard-hitting W12. Still sounds good, this motor, all bass rumblings from a distant engine room. Barely needs a gearbox. Just hook fifth and leave the 12 pistons and double-barrel blowers to get on with it. It’s deeply lovely in here. I suspect the same electric architecture underpins the Bentley’s cabin as does the Panamera’s and A8’s, but this is in a league of its own for luxury, tactility and ambience. The only part that grates slightly is the virtual cockpit dash display that doesn’t operate as intuitively and attractively here as in various Audis. And the gearlever, which has an annoying détente to stop it going straight from D to R.
And – promise this is the last – the confluence of laid back A-pillar and chunky door mirror makes for a big forwards blind spot, while the view out the back is much narrower than you might expect given the length of that piece of rear glass. But as somewhere to sit and feel good about the world and your (financially elevated) place in it, this takes some beating. More hi-tech and driver orientated than a Rolls Wraith, more spacious and better finished than a DB11, clear and mostly logical to use and with a satisfying heft to the control weights so you know you’re operating something with proper status. The wood and leather is beautifully done, the steering wheel has none of that flat-bottom nonsense and connectivity (Airplay etc) is first class. It’s not big in the back, but you’d volunteer this as a way to get four people an hour or two away with room for weekend luggage in the 358-litre boot. Dropping all four windows creates open flanks that give the cabin a lovely fresh airiness if you’re just oozing about, and although there’s a trace of wind noise from the A-pillars at motorway speeds you can distract yourself by flipping the (admittedly optional) Rotating Display that flicks, like Bond’s DB5 numberplate, between three separate plates: a blank veneer, the 12.3in screen and three analogue dials (compass, outside temp and chronometer), for that hint of olde worlde elegance. Comfort is hard to fault on the deep, thick seats and the driving position and cabin access is good. Creaky knees don’t have to drop too far. 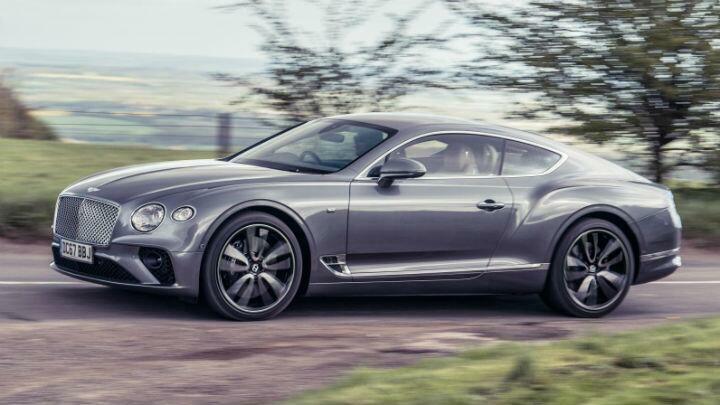 Bentley has given customers what they demanded: a more athletic, sporting, rapid, capable Continental GT. I’m happy for them. In the areas owners obviously care most about – performance and handling, it’s night-and-day better than the old one. The 48v electrics, longer wheelbase and air suspension have brought crispness to the dynamics and allowed the car to cope admirably with the huge increase in straight-line performance. However, it’s also lost a little of what gave the Conti its grand touring reputation in the first place. The waft, surge and cosset is slightly diminished, it’s lost a little of its single-minded individuality. But this is a small thing, almost a matter of calibration. Comfort and relaxation may have slipped maybe five per cent, but dynamism is up 50 per cent. And most importantly, that ability and behaviour suits the Bentley Continental GT well.